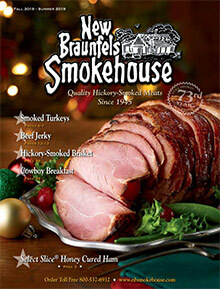 Since 1945, New Braunfels Smokehouse has been preparing Texas hickory smoked meats. Smoked turkey - Make Thanksgiving or Christmas dinner extra special with a New Braunfels Smokehouse rich and juicy smoked turkey that arrives fully cooked and ready to carve. Choose a hickory-smoked or peppered whole turkey or a bone-in or boneless turkey breast. Smoked beef brisket - Treat your family and friends to the slow cooked taste of a smoked brisket. Tender and juicy, their ready-to-serve smoked brisket is perfect by itself, or with their famous Texas barbeque sauce. Texas baby back ribs - Make any meal a special occasion with an order of meaty, juicy baby back pork ribs, drenched in New Braunfels Smokehouse's famous barbeque sauce. Order them alone, or pair them with smoked brisket, sausages, and extra sauce for a ready-to-eat mail order Texas barbecue feast. Tenderloins - Pile your sandwich high with slices of fully cooked pork, turkey or beef tenderloin. Each peppered and smoked tenderloin is ready to slice for appetizers, grilling or lunch boxes. Smoked cheeses - Compliment your smoked meat choices when you buy smoked cheese online or from their catalog. Choose cheddar, jack, Swiss, or Mozzarella, or save when you try all four. Their generous smoked cheese samplers, or cheese and sausage combos are popular as corporate Christmas gifts or employee recognition rewards. Snacks, condiments and sauces - Don't forget the extras that make a New Braunfels Smokehouse meal so special. Add their famous chow chow relish, marinated mushrooms and of course a few extra bottles of their famous barbeque sauce for the perfect meal. Stock up on snacks for the weekend when you buy beef jerky online, in flavors from teriyaki to Jalapeno. Finish your meal with Texas pralines, fruitcake, or classic southern pecan pie. For the Texas taste of real smoked bacon, the finest sausages, smoked turkey and beef jerky online, order your smoked meats and barbecue from the leader in hickory-smoked meats for over 70 years: New Braunfels Smokehouse. From corporate holiday gifts to football tailgating treats, let them send the tastes of Texas to you.